White urn-shaped clusters at the ends of the branches. Tas. endemic; Grows in a wide range of situations sea level in west to montane. 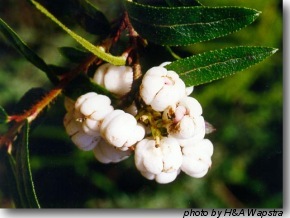 Fine seed is collected from the capsules within the white fruits. Leaving the calyx intact may enhance germination.Results are often erratic.